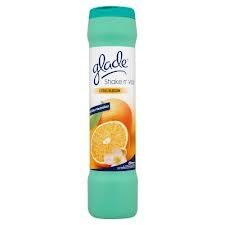 Glade Shake n' Vac is a powdered carpet freshener. The powder is shaken onto the carpet before vacuuming. It is currently marketed and sold in the United Kingdom by S. C. Johnson & Son. The product became well known due to its famous television commercial during the 1980s, with the advertisement being voted as one of the most popular TV advertisements in Britain.